Professor Toland's ninth case of ligation of the external iliac artery for aneurism; recovery. Journal : The Western Lancet ; vol. vii. San Francisco : Cubery & Company, 1878. Description : [1 l.] pl., -161 p. ; ill.: 1 phot. ; 23 cm. Subject : External iliac artery — Aneurism ; ligation. Author caption: Reported by R. A. McLEAN, M. D., Lecturer on Anatomy in the University of California. Chair of clinical and operative surgery at University of California Medical Department, 1880. Dean of the Medical School, 1881-1899. Revision illustrated by a drawing of the photo. 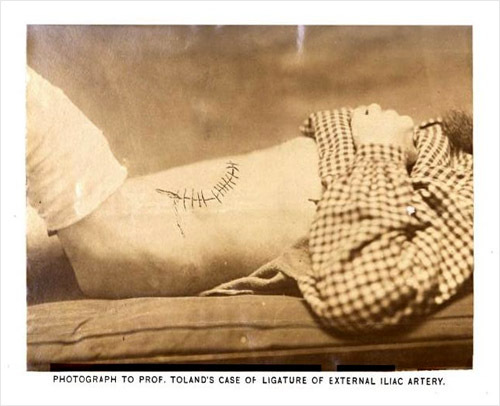 Photo caption: PHOTOGRAPH TO PROF. TOLAND'S CASE OF LIGATURE OF EXTERNAL ILIAC ARTERY. Side view of the subject's abdomen is represented with a lunate surgical wound stitched with silver suture. Ends of silk threads — used in tying off an aneurism in the external iliac artery — exit the wound for the purpose of drainage. The force of Toland's reputation derived from his skill at ligating major arteries and this case was his most studied because the procedure relied on one ligature of the aneurism instead of the conventional two, obviating the risky separation of the artery from its sheath. Robert McLean was the first native Californian to receive a medical degree. He apprenticed with his father, Dr. Samuel Merryweather McLean, who established the first hospital in Stockton California. Doctor Toland, who had established a medical school in San Francisco in 1866, was a family friend and became Robert's preceptor. After Toland's death in 1880, Robert McLean carried on his mentor's medical practice and assumed Toland's leadership at the school, now become the Medical Department at the University of California.